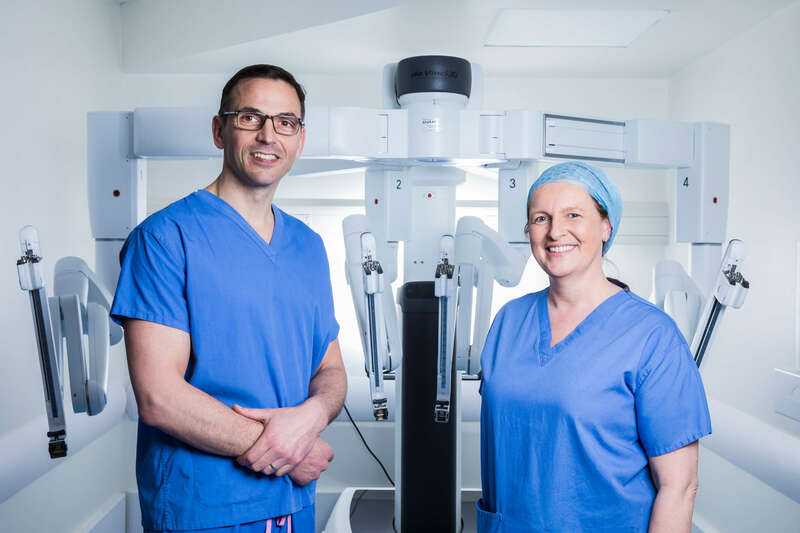 In November 2017, Mr William Robb, Consultant Upper Gastrointestinal (GI) and Bariatric Surgeon performed the first robotic gastric bypass, not just in Blackrock Clinic but in the whole of Ireland. 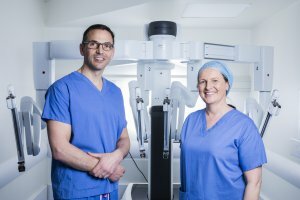 Since then, our “Robotic Programme for Weight Loss Surgery” has gained mu ch further ground. 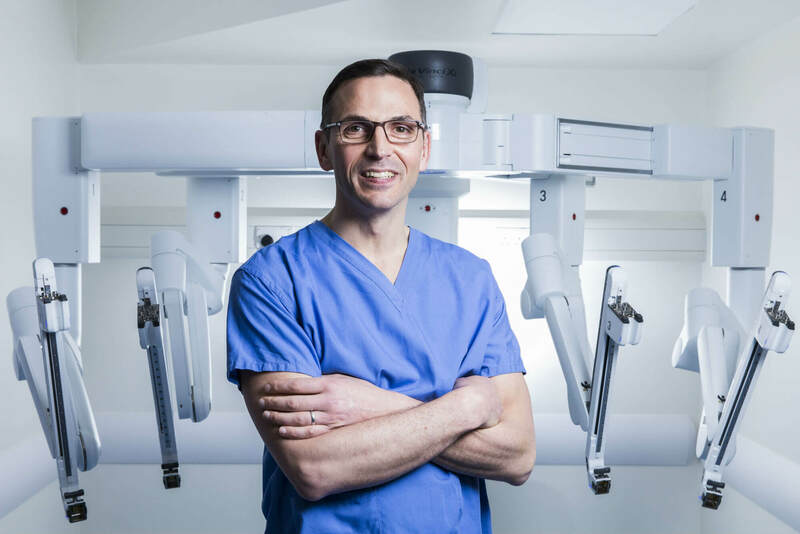 Mr Robb has spent time training in robotic bariatric surgery in the United Kingdom, Austria, France and Portugal during a stellar career in upper GI surgery. Theatre enabling electrical, IT, Operating lights and room ergonomics. Staff training therefore extended beyond the surgical teams, and was intensive. The system remains remotely monitored at all times by the Da Vinci team. Each surgical specialty requires its own multidisciplinary robotic team, trained under the expert management of “Intuitive Surgical®”, the sole supplier of surgical robotics. and are backed by the Central Contamination Unit. The surgeon sits at the system’s computer console situated within the theatre, focused on the 3DHD console image. To raise the eyes from this position requires visual adjustment, so this is kept to a minimum. The surgeon’s hands and feet manipulate the robotic arms, which are jointed to mimic the human wrist. Mr Robb states that he is “very pleased with the dexterity, precision of dissection, and flexibility of the instruments afforded him by the robotic system”. The anaesthetist is positioned at the patient’s head, where they remain throughout the entire surgical episode. Having pre operatively assessed the patient’s fitness for surgery, they will now support the patient through surgery and post operatively. The First Assistant is placed at the surgical site, manually inserting and changing tools via the open ports (incisions) at the surgeon’s instruction. The Assistant’s view is via the robotic system’s 2D “Vision Cart” as is the remaining theatre team. Good surgical knowledge and excellent communication skills are essential in this role, as the First Assistant is the working hands of the surgeon. The only two team members to be present across all specialties are CNM1 Robotic Theatre Coordinator (Denise Mooney), and the Robot itself. Denise is pivotal to the running of the Da Vinci Xi system and embraces her responsibilities with dedication and commitment. One of her challenges is to maintain stocks of the robotic instruments, which are imported from mainland Europe. To experience the team at work with the robot is inspiring. The calm within the room is palpable. Everybody is seated in the main and as relaxed as possible. Denise explains that “there are no heroes here”. Ergonomic comfort allows the surgeon to perform the operation without the interference of physical stress. The temperature is ambient and the atmosphere calm and tranquil. Voices are low and courteous. It is obvious that the team is bonded by a robust professional trust and respect. The robotic surgical patient case mix for 2017 comprised of Thoracic, Gynaecology, Renal/Urology and General Surgery. Bariatrics is the latest addition to its repertoire. Mr Alan Murphy, the first robotic bariatric patient, was followed into theatre by his wife Deirdre three weeks later. They have proceeded to loose 15 stone between them on Blackrock Clinic’s Bariatric Weight Loss Programme. The couple have enjoyed something of a media presence over the past weeks, appearing in interviews in media and on radio. (You will find several links to these articles at the end of this blog). Faster recovery periods, enabling patients to engage quickly with further treatment paths, for instance chemotherapy following thoracic surgery. 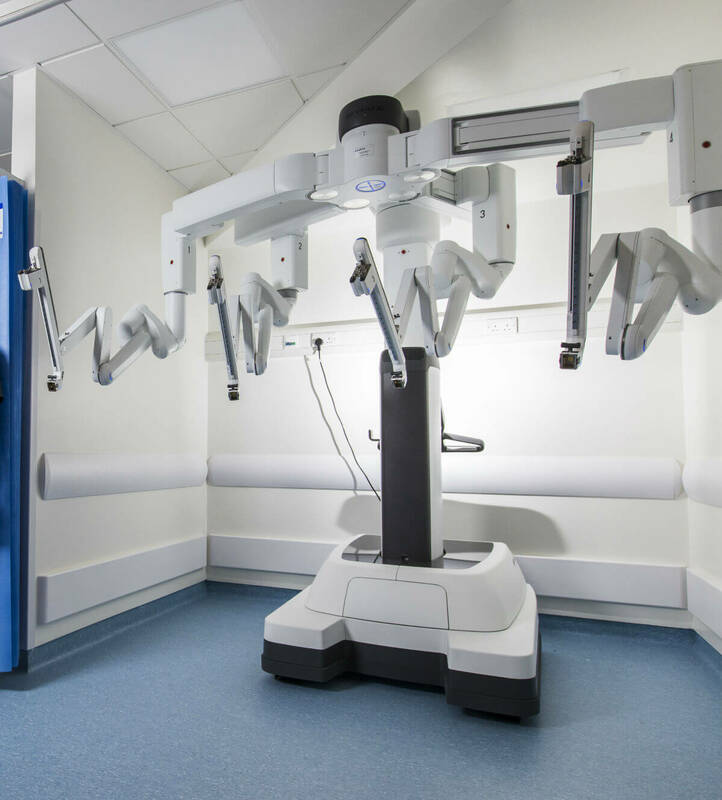 The first surgeon to use Blackrock Clinic’s Da Vinci Xi was Mr Tom Darcy, Consultant Gynaecologist. He considers robotic surgery to be an “absolute advantage to the patient”, which takes us a stage further in our commitment to delivering the highest standards of patient care.